Painting by Procreate for iPad Pro. Milady is nice! She looks like queen! I like this Pokémon, it kicks you when youy down. I like too, Thanks for comment! 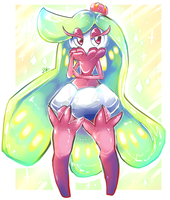 I love Tsareena's form and bright colors!